What do Bernie Madoff and 1960s polyester dresses have in common? That’s not a question you hear everyday. The answer? Dress designer Carl Shapiro, founder of Kay Windsor Frocks. In my hunt to learn more about one of my favorite dresses, I discovered a story about innovative marketing strategies and investment fraud. But let’s start at the beginning. One of my favorite vintage finds is this 1960s Kay Windsor dress. I’m obsessed with the polyester fabric, vibrant orange hue, and psychedelic floral print. I also love the cut of the dress– it skims the natural curves of the body without clinging. When I find a garment with such a flattering shape, I assume it’s either handmade or designer. In this case, the dress is neither. Carl Shapiro founded Kay Windsor Frocks in 1939 because he and his father– then a business partner– spotted an un-fulfilled market niche: stylish, comfortable, affordable dresses for working women and suburban housewives. 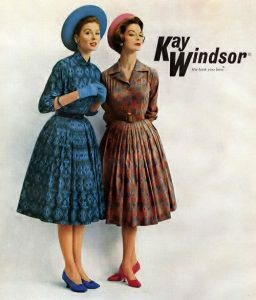 “When Kay Windsor was formed, cotton dresses and inexpensive house dresses were synonymous,” a reporter for the New York Times wrote in 1957. “And retailers would quickly dispense with the services of any buyer foolish enough to suggest that cotton dresses be sold throughout the year.” But Shapiro had an inkling that this untapped demographic would flock to his line. His dresses were trendy but affordable since he used cheaper fabric. The designer was correct. By the end of the 1950s Kay Windsor was a fashion juggernaut. Shapiro used smart marketing tactics to appeal to his consumers. He partnered with the popular TV Show “Private Secretary” to create a line of dresses. The show centered around Susie MacNamara, secretary to talent agent Peter Sands. Naturally, Susie would get caught up in Peter’s personal life and all sorts of high jinx would ensue. When asked to read her boss’s barber’s play she remarked, “Don’t get your hopes up. We even have trouble selling plays by playwrights.” You can enjoy the full episode this bit of banter is quoted from here. Susie was a sassy, stylish career woman and viewers– especially Shapiro’s target demographic– looked up to her. She represented both independence and femininity, a line that was delicately balanced in the 1950s. The actress who played Susie, Ann Sothern, was featured in the Kay Windsor advertisements. Not surprisingly, the line did very well. 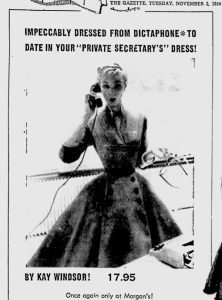 Women were eager to purchase the “Private Secretary” dresses and emulate everything that Susie MacNamara represented. 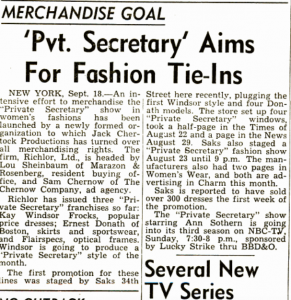 The dresses were featured in the store windows at Saks and as part of a “Private Secretary” fashion show at the department store. I imagine that these high-end partnerships lent the brand a new aura of prestige and expanded Kay Windsor’s reach to a somewhat wealthier demographic. I found quite a few other Kay Windsor advertisements from the 1950s. All feature super-cinched waists and modest necklines. The silhouettes are hyper-feminine (women still wore girdles at this time to emphasize their shape). It’s a bit of a mystery to me why I can’t find a single Kay Windsor ad from the 1960s- or any time after 1959, for that matter. What I do know is that the brand was bought by Vanity Fair in 1971 for $21 million and later sold under JC Penney’s label from 1978-1982. Sales decreased in the late 70s and the line was discontinued in the early 80s. I found quite a few vintage bloggers and Kay Windsor enthusiasts who lamented the “downfall” of the brand throughout the 70s. It doesn’t quite explain why there are so few ads from later decades, especially considering how many vintage sites are selling Kay Windsor dresses from the 60s and 70s. Likely these ads were run in magazines that have not been digitized/archived yet. Perhaps there is “pinterest-bias,” the term I use to describe why some vintage images end up on the internet while others sit in dusty boxes… someone has to decide to put something pre-internet ON the internet. And often, the ads put online are very aesthetically-pleasing, like the early Kay Windsor advertisements. It will be my task for my next Kay Windsor post to do some archival digging. The mogul has since agreed to return $625 million to settle victim losses, though he adamantly denies any participation in Madoff’s ponzi scheme. In fact, the 97-year old claims he gave Madoff $250 million just days before the latter’s fraudulent activity became public in 2008. Who’s to say whether or not Shapiro was involved? It’s a mystery that is now unfortunately inseparable from his legacy as a trailblazing businessman and creative director. When you look up Kay Windsor, links to poshmark and etsy accounts selling vintage frocks are interspersed with articles about Madoff. But at the same time, isn’t that what fashion history is all about? Fashion is inextricably tied to commerce. Where capitalism thrives, businesses will rise and fall like empires. Kay Windsor’s story is one of genius market research and subsequent design & marketing. Rome fell but still stands, no? I’ll be holding on to my Kay Windsor dress for quite a while. I came across this article when I googled the designer. I found a photo of my parents having a private showing at the NY showroom. 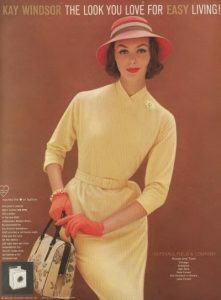 It was published in an old edition of Women’s Wear Daily. I was curious what happened with the designer. The photo is from the late 60’s. Thanks for the info.